Although a thriving seaport existed in Singapore as early as the 14th century, it was the year 1819 that marked the beginning of a modern, outward-looking and multicultural Singapore, Prime Minister Lee Hsien Loong said yesterday. That year was when the British arrived and made Singapore a free port. PM Lee said the move drew immigrants from South-east Asia, India, China and beyond to the island. As well, it made trade Singapore's lifeblood and over nearly 150 years, helped to nurture political values, inter-communal relations and world views that "diverged from the society on the other side of the Causeway". 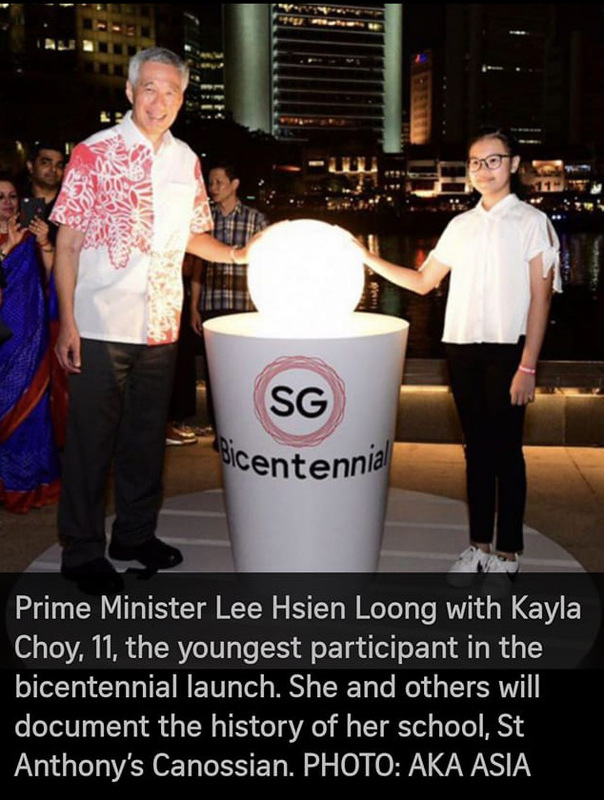 So, without 1819, the path to nationhood as Singaporeans know it today may not have happened, PM Lee said at the launch of the Singapore Bicentennial at the Asian Civilisations Museum. Also, Singapore would not have had 1965, and it would certainly not have celebrated the success of SG50, he added, explaining why the bicentenary is worth commemorating. 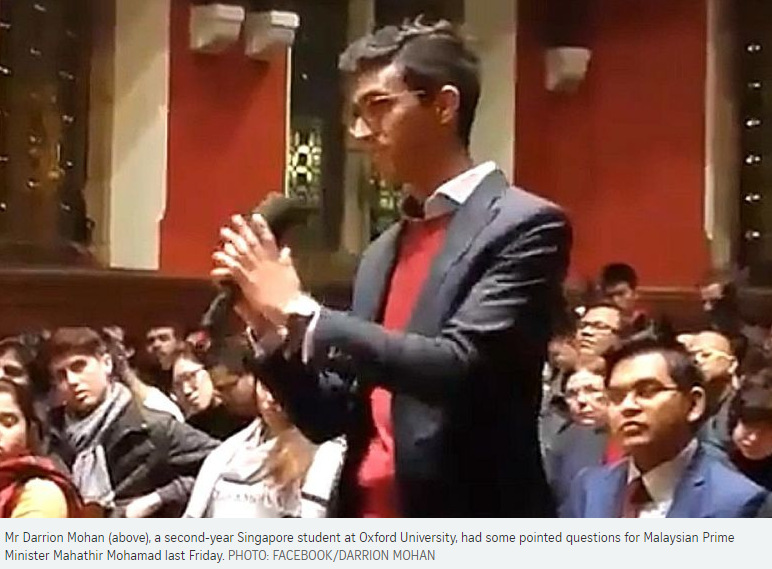 "We are not just remembering Stamford Raffles or William Farquhar, though we should. We are tracing and reflecting upon our longer history, one that stretches back way before 1965. We are acknowledging and appreciating the broader context which shaped and created today's Singapore. "This was our journey, from Singapore to Singaporean." The Prime Minister, in elaborating on the journey, set out the milestones in the Singapore story, which goes back 700 years. He pointed out that Raffles did not "discover" Singapore, any more than Christopher Columbus "discovered" America. By the time Raffles arrived in 1819, Singapore already had hundreds of years of history, he said, citing, among others, the founding of a kingdom here, around the 14th century, by Sang Nila Utama, who named it Singapura. Families of children with developmental needs will have better access to early intervention programmes from April 1, with new subsidies that will cut the cost of government programmes for most families - some by more than half - as well as a broadening of income criteria to allow more to get help. Two new programmes will be added to better meet children's needs as they change over time. One of them, for children under two, will involve a parent or caregiver's attendance. The other lets children who have made progress attend a mainstream pre-school while receiving enhanced support from EI professionals. 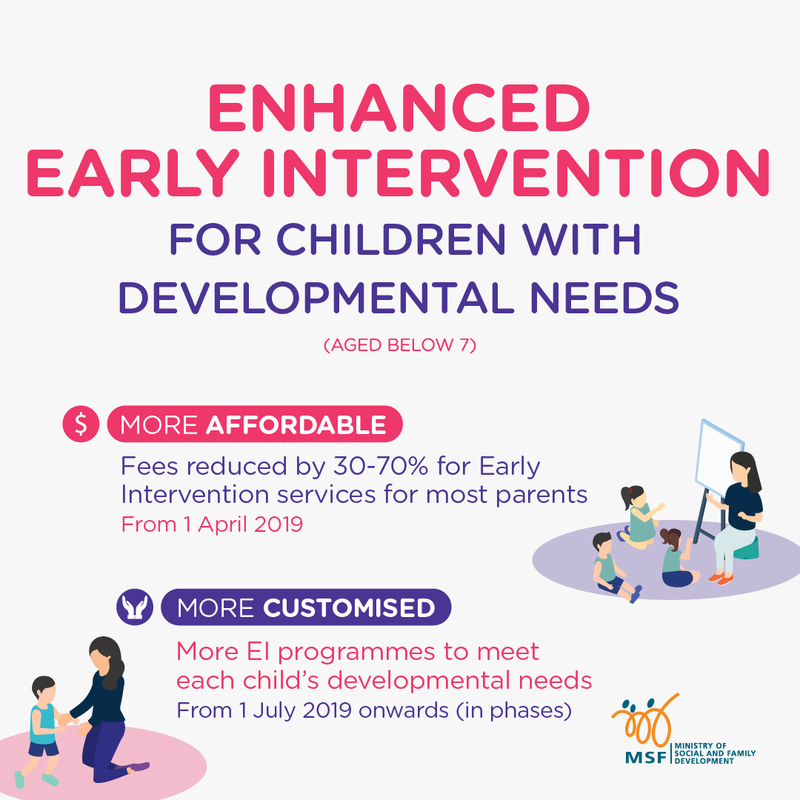 To cover the subsidies and fund the two new programmes, the Ministry of Social and Family Development (MSF) announced yesterday it will channel $60 million a year - 30 per cent more than $45 million currently - into early intervention. The enhanced interventions are expected to benefit at least 4,500 children and their families. "We believe that with good early intervention, targeted early intervention and affordable early intervention, these children stand the best chance to improve their developmental progress," said Minister for Social and Family Development Desmond Lee after a visit to the Awwa Early Intervention Centre in Hougang yesterday. "These children and their families need all the support that we can provide. We are going to reduce the cost of early intervention by increasing subsidies. On average, parents will see a reduction of on average of 30 to 70 per cent in fees." Following the revised subsidies, EI fees will range from $5 to $430 per month, down from $5 to $780 per month currently. 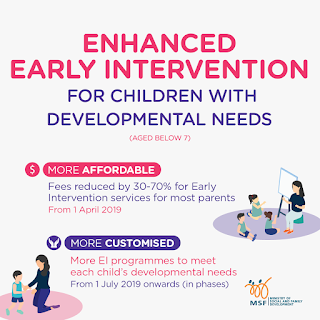 Children under six with moderate to severe developmental needs - physical, sensory, and cognitive conditions as well as learning needs - now receive the same model of care under the Early Intervention Programme for Infants and Children (Eipic) at Eipic centres. The new Eipic Under-2s programme, to be rolled out from July at 13 centres, recognises that toddlers have different needs. A parent or caregiver must accompany the child, and will receive training in identifying and responding to the child's needs at home. Therapists and EI specialists will also make home visits at least once a month. "This programme is also about caregiver support and counselling. The therapists will support the parents by helping them accept their child's condition, and at the end of the day, help them help their child," said MSF. Confidential information of 14,200 people with HIV - including their names, contact details and medical information - was illegally obtained and leaked online by an American fraudster who was deported from Singapore, the Ministry of Health (MOH) revealed yesterday. Mikhy Farrera-Brochez was jailed in 2017 for several fraud and drug-related offences and lying to the Ministry of Manpower about his own HIV status. 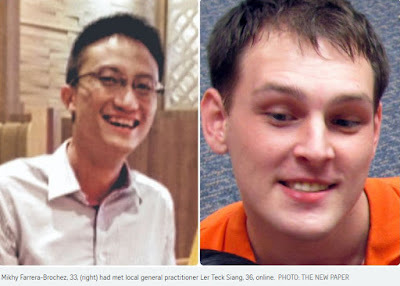 His partner was Ler Teck Siang, a Singaporean doctor who was head of MOH's National Public Health Unit from March 2012 to May 2013 and had access to the HIV Registry. He has been charged under the Official Secrets Act (OSA) for failing to take reasonable care of confidential information regarding HIV-positive patients. Health Minister Gan Kim Yong told reporters yesterday: "I am sorry that one of our former staff, who was authorised to have access to confidential information in our HIV Registry, appears to not have complied with our security guidelines, and this may have led to an unauthorised person gaining possession of the data and disclosing it online." The records leaked included those of 5,400 Singaporeans and permanent residents diagnosed with the human immunodeficiency virus up to January 2013 - of whom 1,900 have died - and 8,800 foreigners diagnosed up to December 2011. Each person's name, identification number, phone number, address and HIV test results were among the information leaked. Details of 2,400 of their contacts - deemed to be at risk - were also leaked. "Our priority is the well-being of the affected individuals," said MOH. It started contacting affected individuals last Saturday, and has successfully reached more than 1,000 out of all 3,500 HIV-positive Singaporeans. However, the information is still in the hands of Farrera-Brochez, who was deported after he had served his jail term. He remains outside Singapore. It came to light that Farrera-Brochez, who was HIV-positive, had used his boyfriend's blood to pass medical tests so that he could work in Singapore, and also got hold of information illegally from the HIV Registry that Ler had access to. Farrera-Brochez, 33, who was a polytechnic lecturer here, was sentenced to 28 months in jail in 2017 for offences including cheating and possession of drugs. Ler, 36, has been sentenced to two years in jail for abetment of cheating and for giving a false statement to a public servant. He is appealing. The ministry learnt of the leak last Tuesday, and made a police report the following day. Since 2016, it noted, additional safeguards against mishandling of information by authorised staff have been put in place, including a two-person approval process to download and decrypt information. Mr Gan said MOH will not hesitate to take stern action against staff who violate security guidelines, abuse their authority or their access to information. The Health Ministry has asked the public to call its hotline on 6325-9220 if they have any information regarding the incident or any concerns. When contacted, the police said that they are seeking the help of their foreign counterparts in their investigations. They also reminded the public that any person who possessed, used or communicated any confidential information under OSA could face stern action. The first phase of the Cross Island Line - Singapore's longest fully underground MRT line - will be completed by 2029 and span 12 stations from Changi to Sin Ming. Transport Minister Khaw Boon Wan said yesterday that the alignment of the 29km first phase has been finalised. When it is completed, more than 100,000 households will enjoy better access to the rail network and shorter travelling times. Bright Hill, a station on the Thomson-East Coast Line, "will further expand to become an interchange station with the Cross Island Line". Phase 1 will have three other interchanges - at Ang Mo Kio with the North-South Line, at Hougang with the North East Line and at Pasir Ris with the East-West Line. 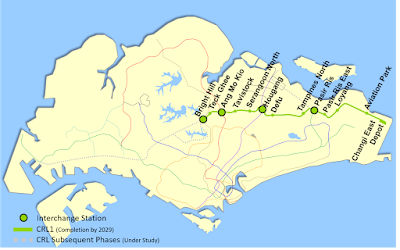 The Cross Island Line, which links Jurong to Changi, will be Singapore's eighth MRT line. Mr Khaw revealed that its depot in Changi East will be a surface depot and not underground as originally planned. He also announced that the first stage of the Thomson-East Coast Line - a three-station stretch from Woodlands North to Woodlands South - will open before Christmas this year. The rest of the line will open in phases up till 2024. 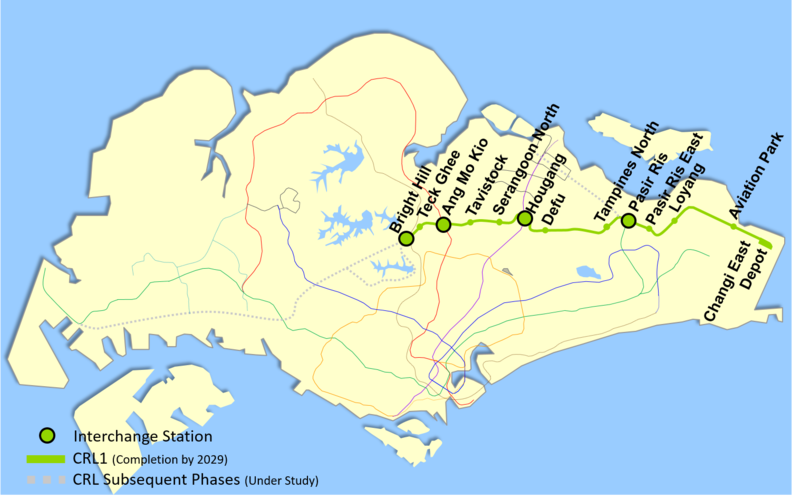 The Cross Island Line is forecast to have an initial daily ridership of 600,000, and eventually one million, making it Singapore's most heavily used rail line. Construction of Phase 1 will begin next year, the Land Transport Authority (LTA) said. Stations will be designed and built to accommodate eight-car trains, but the line will operate with six-car trains initially. The stations are in Bright Hill, Teck Ghee, Ang Mo Kio, Tavistock (Serangoon Gardens), Serangoon North, Hougang, Defu, Tampines North, Pasir Ris, Pasir Ris East, Loyang and Aviation Park. Mr Khaw said the entire Cross Island Line will support hubs outside the Central Business District "so that jobs are nearer homes". It will also redistribute passenger load on the North-South, East-West and North East lines "so that the overcrowdedness that our commuters experience now will be eased". Mr Khaw added that the new line will give commuters "more journey options" and "improve the resilience of our rail network". The Cross Island Line will pass through Paya Lebar Air Base, which is slated to be relocated from 2030. An area of some 800ha will be freed up for residential and commercial developments. However, no station has been planned for this stretch. Why are SP Group's electricity rates higher than retailers'? Mr Albert Tang in his letter (Why are SP Group's rates higher than retailers'? ; Jan 16) asked why electricity retailers are able to offer lower rates than the regulated tariff in the Open Electricity Market. The regulated tariff, charged by SP Group and approved by the Energy Market Authority, reflects the long-term costs of producing and delivering electricity in Singapore, such as the costs of building and operating the power plants and maintaining the power grid. On the other hand, the electricity rates offered by retailers typically reflect the current market conditions, level of competition and short-term costs of producing electricity. Under current market conditions where electricity production capacity exceeds demand for electricity, we can expect market prices to be lower than the regulated tariff. However, this may change over time based on market demand and supply. Consumers should be aware that while the price plans offered by retailers are fixed for the duration of each contract, retailers, like all businesses, may adjust their prices and discounts over time. Consumers who have switched to other retailers can also switch back to buying electricity at the regulated tariff from SP Group. They should check with their retailers if there are any applicable charges when making this decision. In the Open Electricity Market, consumers can also benefit from more choices and innovative offers, such as electricity generated from solar power, as well as value-added packages through bundled products and services. Singapore has identified the United States F-35 Joint Strike Fighter as the most suitable aircraft to be its next-generation fighter jet. The Ministry of Defence (MINDEF) said this yesterday as it revealed that the Republic of Singapore Air Force (RSAF) and the Defence Science and Technology Agency have completed their technical evaluation to select the replacement for the ageing F-16s. The F-35 JSF has been dubbed the world's most advanced fighter jet. 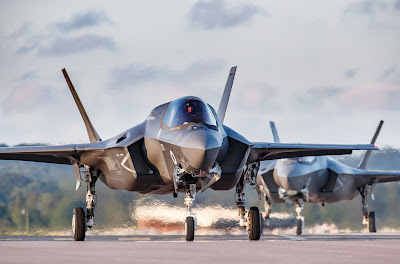 MINDEF said the evaluation concluded that the RSAF should first purchase a small number of F-35 JSFs for a full evaluation of their capabilities and suitability before deciding on a full fleet. In the next phase, MINDEF will enter into talks with relevant parties in the US before confirming its decision to purchase the fighter jet. No further details were given on the exact number or variants of the F-35s - manufactured by Lockheed Martin - that will be acquired. The F-35 has stealth functions that make it difficult to detect by enemy radar. It also has network capabilities in fusing information from other F-35s and friendly forces to build up a picture of the battle space. There are three variants of the aircraft, including a short take-off and vertical landing version that can land like a helicopter. In a Facebook post yesterday, Defence Minister Ng Eng Hen wrote that the talks with US counterparts could take nine to 12 months before a decision is made. 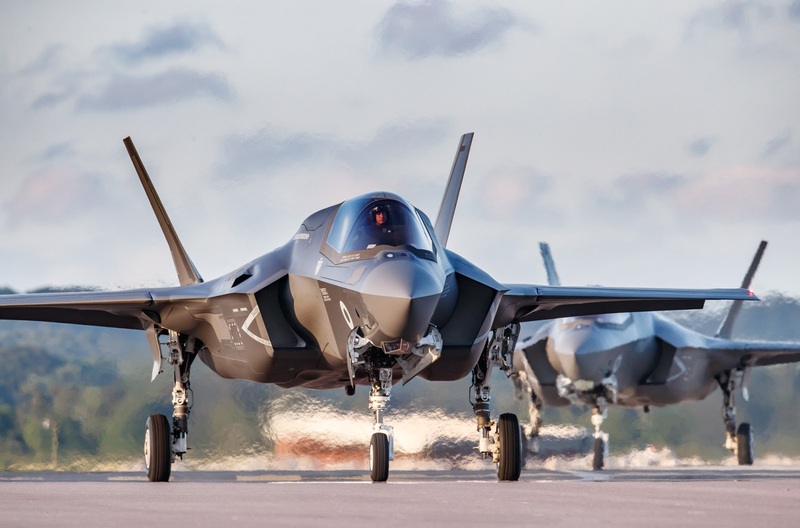 "Even then, we want to procure a few planes first to fully evaluate the capabilities of the F-35 before deciding on the full acquisition of a full fleet," he added. "We must prepare well and cater enough time to replace our F-16s." Dr Ng pointed out that the RSAF's F-16s, in service since 1998, will have to retire soon after 2030 even after their mid-life upgrades. "That is not very far away, just over 10 years, to acquire their replacement and, just as important, to build the logistic support and train pilots individually and as a fleet to guard our skies," he wrote. The minimum age to receive monthly payouts from Central Provident Fund (CPF) savings will not be lowered for now as it was raised to 65 only last year, Manpower Minister Josephine Teo said yesterday. Employees appear to be more concerned about being able to work longer and save more, she told Parliament, which is why her priority this year is to build a new consensus between workers, employers and the Government on the retirement and re-employment ages. She was replying to Ms Lee Bee Wah (Nee Soon GRC), who said retirees have approached her asking for an earlier CPF payout, as they lack money but are healthy and cannot appeal on medical grounds. In fact, said Mrs Teo, more than half of the Organisation for Economic Cooperation and Development countries, which are developed nations, have set their pension withdrawal age at 65 or older. Some are raising it in the light of increasing longevity, she added. For example, The Netherlands, Denmark and Germany are raising their respective pension withdrawal ages gradually to reach 67 by 2021, 2022 and 2029. 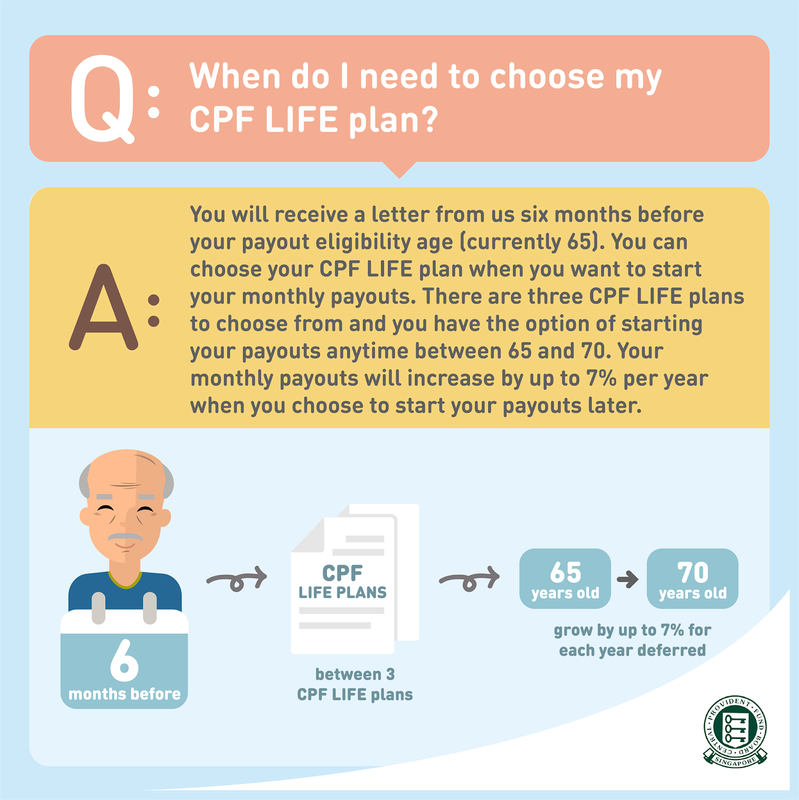 "So against such a backdrop, we must really ask if it is wise to lower our own PEA (payout eligibility age)," Mrs Teo said, referring to the minimum age at which CPF members can start receiving their monthly CPF Life payouts. However, permanently incapacitated or terminally ill CPF members, for example, can apply to withdraw their savings or start their payouts before age 65 under the Medical Grounds Scheme. Most applications - about 65 per cent - in the past three years were successful. Mrs Teo also disclosed the payout eligibility age was not a major concern for workers during feedback sessions held by the Tripartite Workgroup on Older Workers. The group, of which she is an adviser, began its review of the retirement and re-employment ages, plus the impact of CPF contribution rates on retirement adequacy, last year. She has since met union leaders from industry clusters such as aerospace, logistics, healthcare, financial services and the public sector. The feedback from the sessions and focus group discussions with people was that workers want the opportunity to work longer and save more. "I want to be able to help make it happen (for these workers). At the same time, employers have also expressed their concerns to me. They have worries about their increased obligations," she said, adding that their considerations should not be taken lightly and dismissed. This is why it is important to find common ground and consensus on the retirement age, which is 62, and the re-employment age, which is up to 67, she said. "The new tripartite consensus is an important one and is the topmost of my priorities this year." Amid anxiety over jobs and the state of the economy, Prime Minister Lee Hsien Loong's message to Singaporeans is that resources and the resolve are in place to help them train and take on new jobs. "We have the resources, the plans and the resolve. We will help everybody to get through difficulties. We will help you, walk together with you, to overcome these troubles," he said on a visit to Workforce Singapore's Careers Connect at Lifelong Learning Institute in Paya Lebar. It lets jobseekers meet career coaches and tap a wide range of resources. 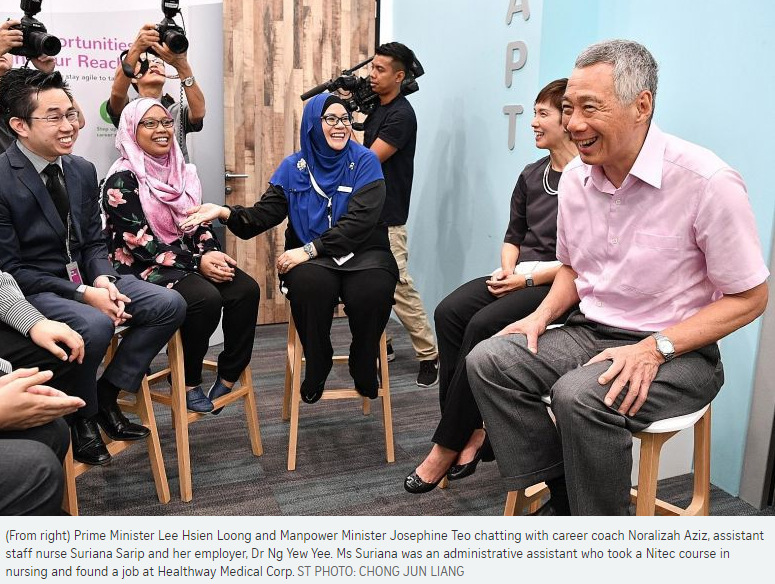 Yesterday, PM Lee met workers who had changed or were changing jobs, employers and career coaches, and spoke to them about their experiences for around 21/2 hours. "A lot of good work is done, there is a lot of passion," he told reporters at the end of his visit, adding that Singaporeans should have confidence that they can cope with economic transformation. 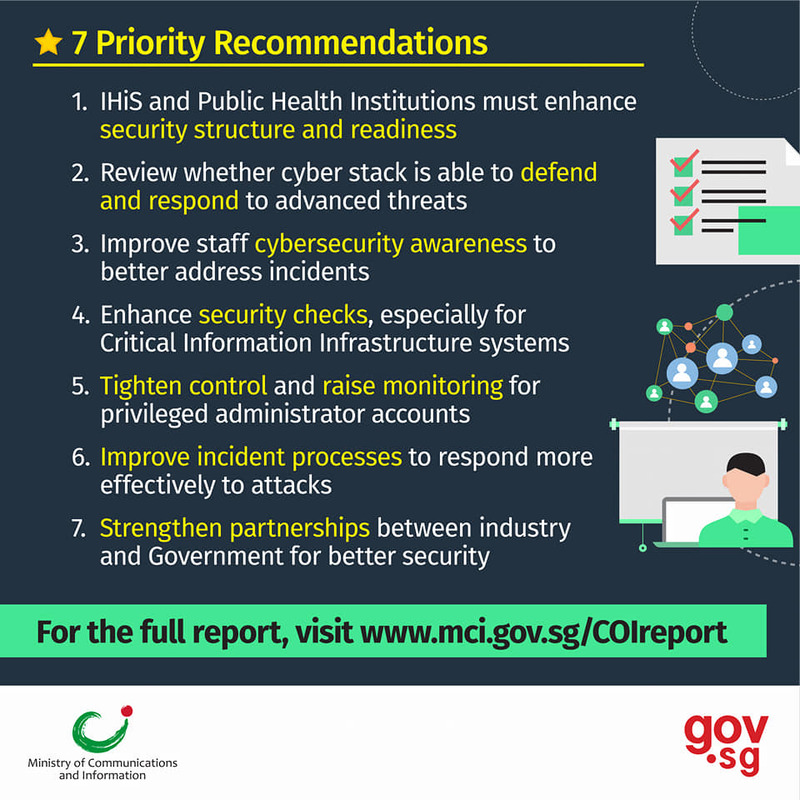 These were among the basic failings that opened the door to Singapore's worst data breach, according to the public report by a high-level panel tasked to probe last June's cyber attack on SingHealth. And such lax cyber-security practices were no match for the sophisticated cyber attackers, believed to be state-linked. In fact, the Singapore authorities contacted foreign law enforcement agencies for information on the users behind servers linked to the attack. The 453-page report also offers 16 recommendations - seven of them classified as "priority" - to shore up defences at organisations responsible for critical information infrastructure (CII) systems. Among other things, CII owners including SingHealth must set rules, to be reviewed at least once a year, to protect their systems against cyber-security threats. All administrators must use two-factor authentication, and the use of passphrases instead of passwords should be considered. The industry and the Government should also share threat intelligence. 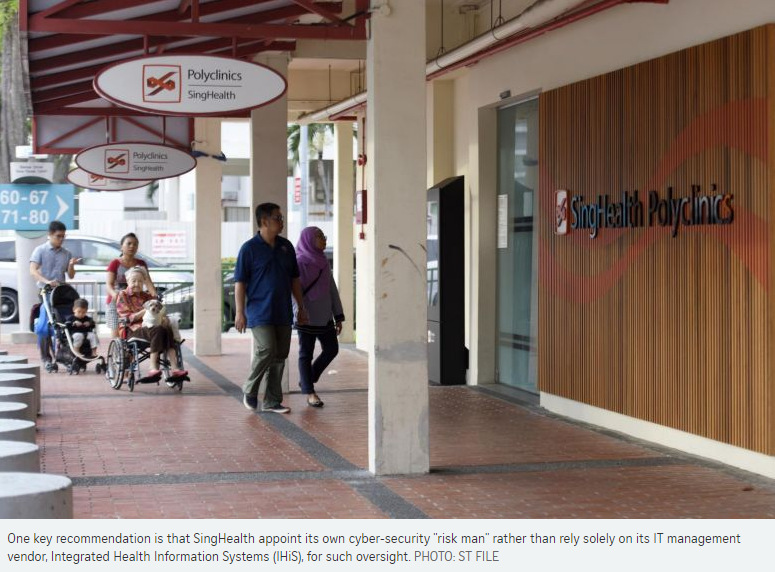 One key recommendation is that SingHealth appoint its own cyber-security "risk man" rather than rely solely on its IT management vendor, Integrated Health Information Systems (IHiS), for such oversight. At present, all the domain expertise and resources to detect and manage cyber-security risks lie with IHiS, which the Committee of Inquiry (COI) said is "difficult to sustain" in the long run. The report also provides a blow-by-blow account of the events that led to the cyber attack. 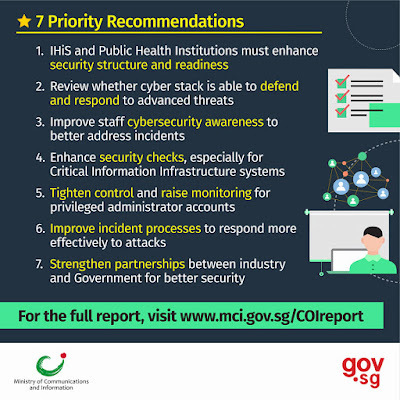 Despite the attackers being sophisticated, the COI said, the data breach could have been averted if not for "a blanket of middle-management mistakes" at IHiS, Singapore's central IT agency for the healthcare sector. For instance, a middle manager of cyber security at IHiS had misconceptions of what constitutes a cyber-security incident, and delayed reporting the network intrusions for fear that additional pressure would be put on him and his team. Also, the key technology "risk man" at IHiS - cluster information security officer Wee Jia Huo - displayed "an alarming lack of concern" when it was clear that a critical system had been potentially breached. 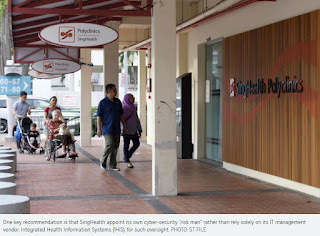 These lapses contributed to successful data exfiltration from SingHealth's electronic medical records system from June 27 to July 4 last year. Hackers stole the personal data of 1.5 million patients and the outpatient prescription details of 160,000 people, including Prime Minister Lee Hsien Loong. "The attacker had a clear goal in mind, namely, the personal and outpatient medication data of the Prime Minister in the main, and also that of other patients," the report said. But it also noted: "The attacker was stealthy but not silent, and signs of the attack were observed by IHiS' staff. Had IHiS' staff been able to recognise that an attack was ongoing and take appropriate action, the attacker could have been stopped before it achieved its objectives." 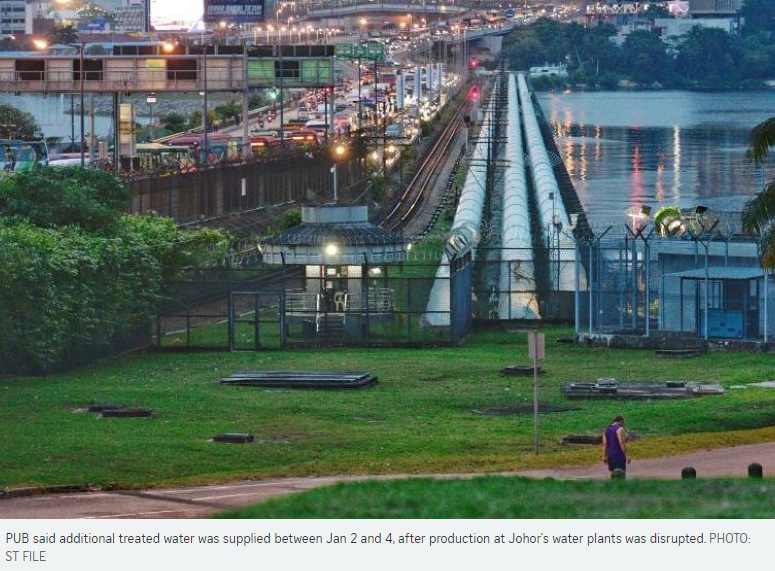 Singapore's water agency PUB has, at Johor's request, supplied additional treated water to Malaysia after production there was disrupted due to pollution. In response to media queries, PUB said yesterday that an additional six million gallons per day (mgd) of treated water was supplied between Jan 2 and Jan 4. PUB said production at Johor's water plants was disrupted recently by pollution in the river catchment. 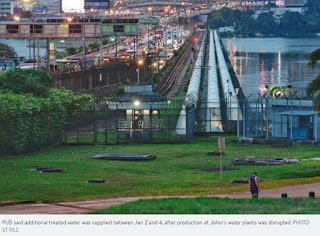 PUB's Johor River Waterworks was not affected by the incident. "At Johor's request, PUB helped to tide Johor residents over the water supply disruption by turning on PUB's Pasir Gudang offtake and supplying an additional six million gallons per day of treated water between Jan 2 and Jan 4, 2019," a spokesman said. The 6 mgd was on top of the 16 mgd that Singapore usually supplies Johor. Under the 1962 Water Agreement, Singapore is required to supply Johor with 5 mgd of treated water. In practice, the Republic has been supplying 16 mgd of treated water to Johor at its request. Last year, Singapore also supplied additional water in excess of the usual 16 mgd for 20 days at the request of Johor, PUB said. PUB added that it has supplied all the additional treated water above 5 mgd on "a goodwill basis" at the same price as under the 1962 Water Agreement, that is, 50 sen per 1,000 gallons. This is a fraction of the cost of treating the water, and "has been done without prejudice to our rights under the 1962 Water Agreement". The agency said there has been long-standing cooperation between the water agencies of the two countries. "PUB has thus far been responsive in assisting Johor residents to reduce the impact of their water disruptions, in the spirit of good neighbourliness." Are MediShield Life payouts lower than subsidised fees? Either the national health insurance claims limits are too low, or public health institutions are charging fees that are too high for those procedures. Time to square the circle. Good healthcare is not cheap. To ensure that all Singaporeans can afford the medical treatments that they need, the Government provides generous subsidies for people opting for basic medical care without frills. Since 2015, it has added another layer of "safety" with the launch of a compulsory national health insurance - MediShield Life - that provides cradle-to-grave protection against big medical bills at subsidised government centres. For those who still can't afford to pay for healthcare in spite of the subsidy and insurance, there is further help in the form of Medifund, an endowment fund set up by the Government to pay for medical treatments for the poor. With all these schemes in place, the healthcare needs of Singaporeans should be well taken care of. Unfortunately, in practice, things do not always work out as planned. When MediShield Life was launched, people were promised peace of mind for their big hospital subsidised bills, although there is a $100,000 cap on claims each year. People need to take care of the smaller bills themselves - hence they must pay a yearly deductible of $1,500, $2,000 or $3,000, based on ward class and age, before insurance kicks in. They can only claim from MediShield Life after paying that sum from their own funds, usually from their Medisave. The problem is also not with the annual insurance cap of $100,000. It was explained that this was to keep premiums affordable. For people with such huge subsidised bills who need help, there are other sources, such as Medifund. No, the problem lies in something less visible to patients: how much public institutions charge and what the Ministry of Health (MOH) allows MediShield Life to cover. The catch lies in what is "claimable" from MediShield Life. MediShield Life covers 90-97 per cent of the "claimable" bill after the annual deductible has been paid by the patient. Many would take the "claimable" amount to be the subsidised rate charged to patients. Of course, if someone covered by the basic MediShield Life opts for private care, you'd expect the person to pay more out of pocket. But in a public hospital, you'd assume that what a fully subsidised patient is charged for a procedure is what he can claim. The problem arises when the subsidised fee turns out to be much higher than what you are allowed to claim from MediShield Life. And you realise that you have no coverage beyond the claimable amount, and must pay the rest yourself. This was what happened to Mr Seow Ban Yam, 83, last year. 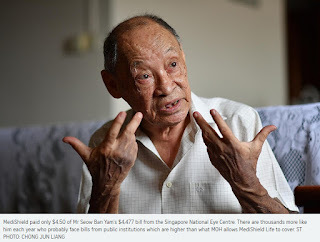 His subsidised bill at the Singapore National Eye Centre (SNEC) to unblock the flow of his tears was $4,477. 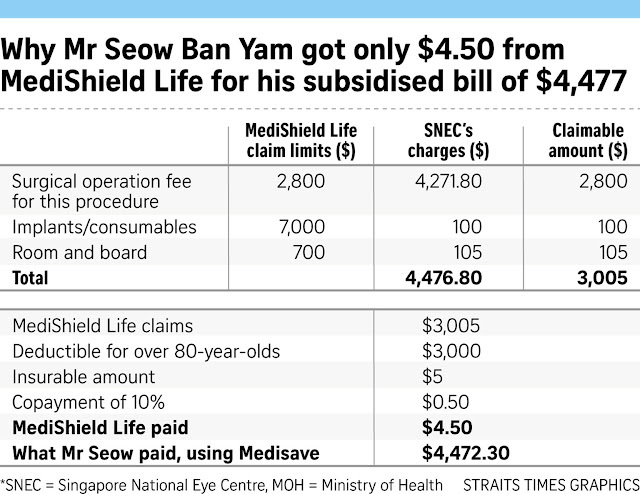 But the Central Provident Fund, which runs MediShield Life, said only $3,005 of that bill was claimable. The rest was above the limits set by the MOH. 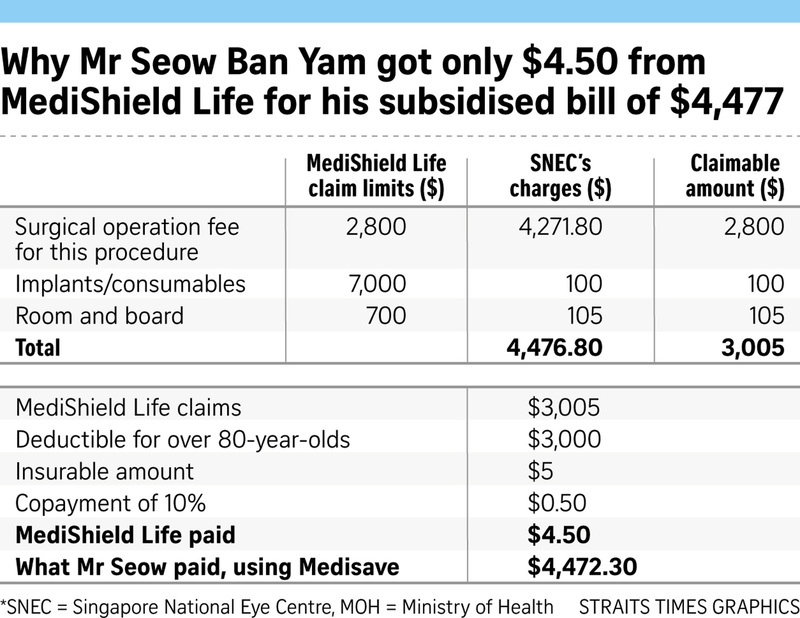 Since Mr Seow is over 80 years old, he has to pay the deductible of $3,000 himself. That left $5 of the bill, for which MediShield Life paid 90 per cent, or $4.50. The problem was this: The subsidised fee for his surgery alone was $4,271. The "claimable" amount from MediShield Life for the surgery he went through was $2,800. This amount is stated in the MOH's table for surgical procedures but there is no explanation of how this amount was arrived at. The difference of $1,471 is not claimable, so Mr Seow has to pay that himself. Mr Seow had enough Medisave funds, so he could dip into his personal Medisave account to do so. The question here is: Why are public institutions charging subsidised fees far higher than what MOH will let you claim under the national insurance scheme? MOH sets the maximum reimbursable amount for more than 2,500 subsidised procedures. Shouldn't these limits - set out in the table of surgical procedures - match what public institutions charge fully subsidised patients? Yet in Mr Seow's case, the subsidised SNEC bill was 45 per cent higher than the limits set by MOH for insurance cover and Medisave claims. Based on the replies The Straits Times received from both MOH and SNEC, Mr Seow's case is not unique. Thousands of patients probably find themselves in the same boat each year, facing bills from public institutions which are higher than what MOH allows MediShield Life to cover. How does MOH arrive at the claimable limits set out on its table? How do they stack up against what patients are actually charged at public hospitals?